Your multi-color printed can insulator is collapsible, allowing you to conveniently carry it anywhere you go. Perfect for a variety of different event...company picnics, organization's fundraisers, family reunions and marketing trade shows...your custom koozie will become the crowd favorite taking your name to new places. 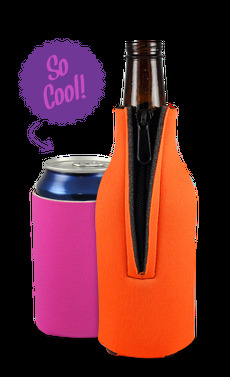 Your can koozie was cut from premium 1/8" thick scuba material to offer better drink insulating power but still maintaining a lightweight feel. It was then tailored to snuggly fit the common size 12 oz. can. The Coolies we ordered were very well done and good quality. The service was fast and professional. Thanks for an excellent product!